Stories differ on where the ‘Happy Valley’ moniker originated, but the term was possibly coined during the Great Depression since the area survived it so well–thanks to the university. And it’s safe to say this energetic college community lives up to its cheery name. 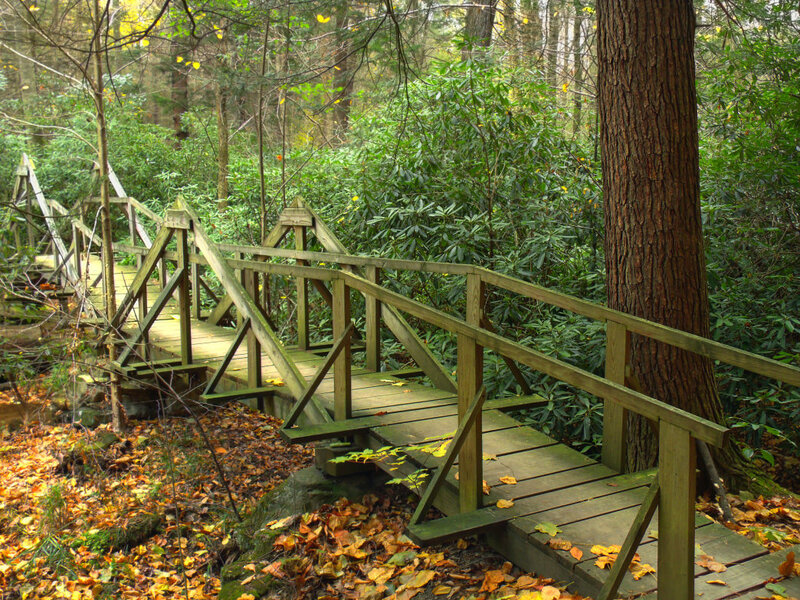 Home to one of few remaining old growth forests in the state of Pennsylvania, this natural area is the perfect hike for little ones. The .8-mile trail loops clockwise through an old-growth forest and along Standing Stone Creek, across footbridges, past young maple and oak trees, and into tunnels of 20-foot tall rhododendrons before terminating at the parking area where the trail began. Happy Valley’s classic hike, Mount Nittany is the perfect area intro, but don’t expect to find solitude. Penn State students and alumni flock here for views of campus—especially at sunset. Directional signposts make the trail to the top easy to follow, and the 3.5-mile White Trail is the best route to the well-known Mike Lynch Overlook. From the top you’ll see popular Penn State sights like the massive Beaver Stadium, which holds over 100,000 football fans. Less than 10 minutes from downtown State College, this underrated beauty is the place to escape the city fast and venture into a quiet forestscape. 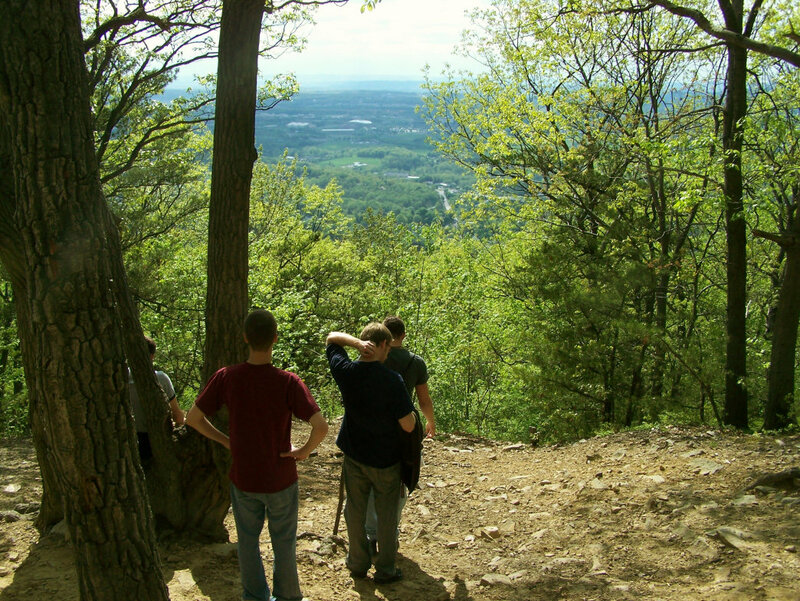 Choose from creekside trails or mountain climbs with options for beginning trekkers and advanced hikers. For a leisurely walk, follow the blue-blazed lower trail from the parking lot along Roaring Run, a stream surrounded by tall rhododendrons and moss-covered, old-growth forest. 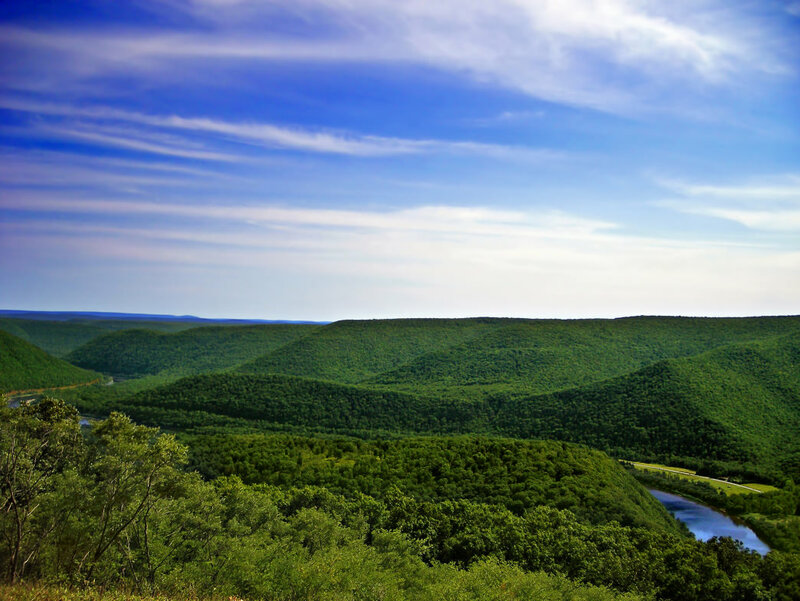 For a challenge, take on the rocky 3.8-mile hike up Tussey Mountain to panoramic views at the Roman Tower. Known as the wildest path in Pennsylvania, this 323-mile trail runs the length of Pennsylvania and passes directly through State College. The State College section takes you through state parks, natural areas, and has the trail’s only tunnel—found just east of Poe Paddy State Park. It’s also the birthplace of the Mid State Trail, and you can see the monument to founder Dr. Thomas Thwaites on the trail just south of town. For a short hike with big rewards, walk 1.4 miles along the ridgeline from Little Flat to Big Flat to reach Indian Wells Vista. From here, the trees open up to a rockfield that overlooks the Bear Meadows bog and autumnal-leafed trees in fall. The first few miles of this hike to the first viewpoint, David’s Vista, are welcoming for kids, but beyond that that the frequent rockfields will make you understand why Pennsylvania’s gained the nickname Rocksylvania. If you don’t mind rocks and a challenge, complete the three-mile, one-way walk to a scree-covered ridgetop on Tussey Mountain. The scramble’s fun but can be unforgiving if you bring the wrong footwear. Pack your sturdy hiking boots and head here for hiking without crowds and views stretching up to30 miles. Located four miles south of Boalsburg, Pennsylvania, the Bear Meadows Natural Area is part of the Rothrock State Forest. 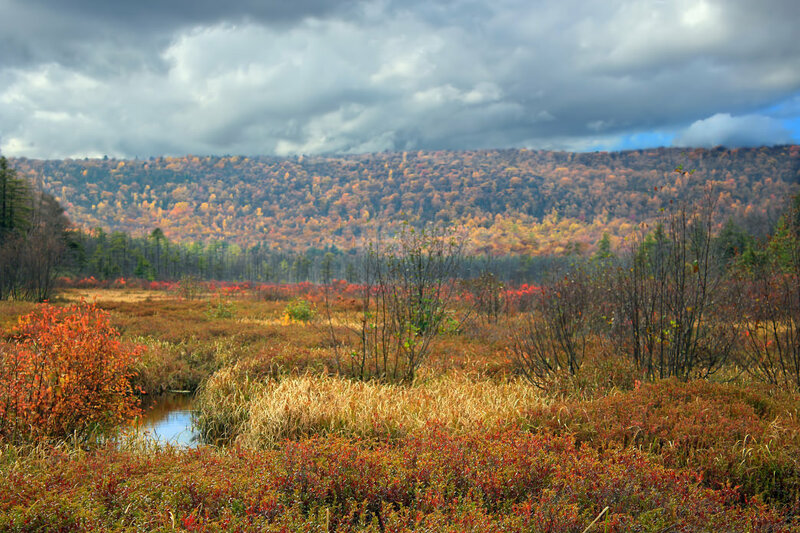 This section is known for its wetlands—the Bear Meadows Bog—that’s filled with wild blueberries in the summer months. Maybe that’s why the area is also known for the black bears that gave the area its name. Start at the parking area at Bear Meadows Road, where you can hop on the 3.7-mile loop. There’s really no climbing to speak of, making this an excellent route for first-time hikers. You’ll also find a wide variety of terrain, from rhododendron bushes to tall pines, with a section through the more open area nearer the wetlands. The well-marked trails also make this a good option for a winter hike. This nearly 8-mile section of trail in the Black Moshannon State Park offers a little bit of everything, as it covers both thick forests and scenic wetlands. You enjoy a trip through pine plantations, hemlocks, spruce groves, hardwood forests, grassy meadows, patches of blueberry patches (especially good in the late summer), ponds and various other wetlands .The two boardwalk sections of the trail allow you to explore the marsh and an alder swamp. Even with the boardwalks, you can expect to get wet at various points along the trail, so waterproof footwear is recommended. There’s not much climbing, which also makes this a popular spot for cross-country skiing in the winter. If you’re looking for a serious hike, the Donut Trail is one of the region’s best. The approximately 90-mile trail runs through the Sproul State Forest, following the West Branch of the Susquehanna River. This is a remote and challenging route, best left to experienced backpackers and hikers. Of course, day hikers can choose smaller sections of the trail, which runs from close to the intersection of PA Route 120 and PA Route 872 in the west, and finishes up in Farrandsville, just outside of Lock Haven. You’ll find a number of stream crossings along the way, including a wide one at Kettle Creek, which should not be attempted during high water. For those looking for a true escape, it’s tough to beat this trail. Written by Jenny Willden for RootsRated in partnership with Visit Penn State.